Ch. Nonsuch Song Sparrow CGC was bred by Karen and Kalen Dumke of Nonsuch and is by MBISS Am. Can. Ch. Nonsuch Prince Charming ROMX-C and out of Specialty winning Am. Can. Ch. Nonsuch Phoebe. Very much my heart dog...Singer finished quickly (all owner handled) at just over 2 years with back-to-back 4 point majors. He was an impressive male with floating movement, beautiful type, and good substance. Singer was also a big smooch and smiler, loved his toys, and was confident he was my lap dog. Occasionally specialed, Sing went BOB owner-handled over top-5, professionally handled special competition. We were working towards a Rally title before his untimely and sudden death due to hemangiosarcoma. Sleep well sweet Singer. You are missed. 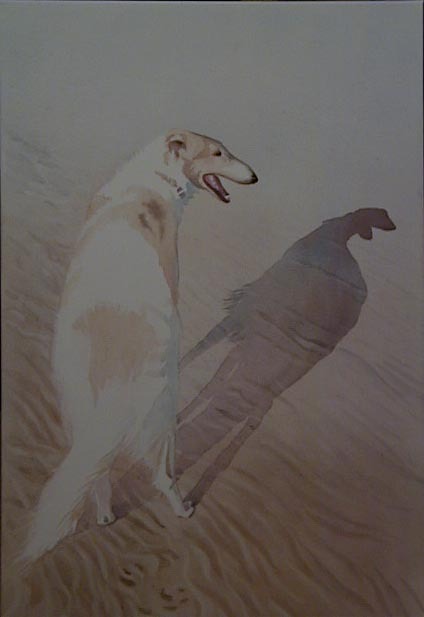 Painting of Singer by breeder/judge/artist/friend, Susan Sills.